The weather is finally warming up so we can start spending time outdoors. But there are a number of hot webinars that might tempt you to stay indoors and at your computer in June. Some of the topics we’ve found include: Smarter Email Marketing; Engaging the Volunteer of the Future; Lessons to Make You Website-smart; Getting Your Donors to Fall In Love With You; Telling the Story of Volunteer Impact and much more. Take a look through the list of webinars below and share this with your non-profit and membership friends and colleagues. Who said summer school can't be cool? The feedback has been so positive for Network for Good's online Ultimate Donation Page Course, we want to bring it to you in real time! Our very own digital giving expert Caryn Stein will lead a lively workshop filled with online fundraising best practices and must-do tasks that will help you optimize your donation page. Join this webinar to learn how to raise more money this fall—and all year round. Register now, this is one class you won't want to skip! Hiring the wrong person for a job is frustrating and costly. How do you make sure that what you see in the interview process is what you get when the person actually comes to work? How do you make sure that a candidate can actually deliver on their promises? An activity-based assessment takes the guesswork out of the hiring process and demonstrates a candidate's ability to do the job. Email continues to be the most effective way to engage donors and volunteers online. But many small and medium-sized nonprofits don't know how to use email effectively. Getting people to "opt down" instead of "opt out". Now that your nonprofit has decided to establish a mobile presence, what can you say to engage donors, volunteers, and other constituents? In this webinar, you’ll learn how to harness the huge potential of mobile- how to turn it into a tool for change, instead of just another medium. We'll also look at tips and tools for integrating your mobile efforts with social media and events, as well as how to measure and optimize your efforts. This webinar is part of a four-part Mobile Impact webinar series, presented by TechSoup, BetterWorld Wireless, PayPal, and Network for Good. View the first webinar Mobile Impact 101: Take Your Cause Mobile and watch for more upcoming events. Have you tried to improve your nonprofit's website but feel like you're not making enough progress? Save yourself a lot of time and frustration and attend this Smart Cause Digital webinar. You will learn the 5 key strategies you need to create compelling webpages, raise more money via your website and get more traffic to your website. Building on our annual cycle of nonprofit planning webinars (three on strategic planning and one each on integrated planning, facility planning, and mission statements), we will offer a discussion-based planning clinic. If you have a question, issue or problem relating to any aspect of nonprofit planning (strategic, business, program, or facility planning, or related issues) just sign up for this session, and I will respond to it. I will frame my comments broadly in terms of general principles while also offering specific guidance to the questioner. As with all of the 4Good webinars, the questioner will be identified by first name only (or not at all, if requested). Bring your thorniest issues, and let’s see what we can do with them. With over 150 million monthly active users, Instagram is a top choice for online photo-sharing, video-sharing and social networking. Join Alexander Zanfir (SocialPlay.com) in this practical MyCharityConnects webinar that will show you how to perform basic functions, use it to tell your story, engage your donors, grow your followers and much more! Please note: Registration for MyCharityConnects webinars is open to employees, volunteers, board members and donors of Canadian charities and nonprofits. Landing that first donation is hard – but getting the second gift can be even harder. In this webinar, Farra Trompeter, vice president of Big Duck, will explore 11 ways you can tell if your donors love you. Through examples from nonprofits of all sizes, Farra will offer tips on new techniques you can try to woo current donors, lapsed donors, and even unsuspecting would-be donors (aka “prospects”) into everlasting love. It seems to happen in a lot of workplaces. Someone is difficult. It can be a client, peer or (gulp) your boss. Or it could be that incommunicative guy in the mailroom, the gossipy fundraiser, the surly receptionist or the aggressive fill-in-the-blank that puts a crimp in your day. Dealing with difficult people does not need to be that difficult and can be the beginning of an admired and desired skillset in today’s multigenerational, multicultural workplace. Learn how in this 4Good webinar presented by Sherri Petro of VPI Strategies. It's no coincidence that many great grant proposal writers once worked as journalists. Like proposal writers, journalists have a knack for telling clear, compelling stories using quotes and objective evidence. This 4Good webinar, led by a grant proposal writer who began as a reporter, explains how to interview individuals such as organization clients to create more impactful proposals. Interviewing "tip sheets" and real-life examples that helped get grants. 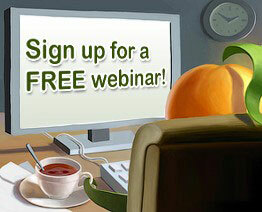 If your organization offers a free webinar that would be of interest to non-profit, membership or volunteer-based organizations and you want to include it in next month's post, please email a brief overview (like those above) to lori@wildapricot.com no later than June18th.